Platform tennis is a racquet sport that was created in hopes of playing tennis throughout the winter without the need to go indoors. The general rules of tennis still apply, however there are a few key differences that separate platform as its own brand of tennis. For instance, a tennis court measures 78’x36’ (LxW) and a platform court measures 44’x20’. Secondly, there is only one serve allowed in platform tennis. This is considered the great equalizer for the sport because players still have the option to hit a booming first serve just like in tennis, but must be sure not to squander their opportunities. The next, and probably most glaring difference, is that the ball may be played off of the screens that surround the court. Once a serve is in play, the ball may bounce off of the playing surface and then may hit any of the screens. The ball must be played back over the net before the ball bounces twice, just as in tennis. The last major rule difference is that in platform tennis there are no service lets. If a serve hits the net and lands in the service box it is a live ball. In light of the court size and the usage of screens for play, platform tennis requires a different type of ball and racquet. The ball is the same size as a tennis ball but is constructed very differently. At first glance it may be hard to tell them apart as they are both covered in felt. Once you place a ball in your hand though you will realize the differences immediately. The weight of the ball is the biggest difference with a tennis ball weighing 2oz while a platform ball weighs just over 2.5oz. The platform ball has a solid rubber construction and is not hollow in the core like a tennis ball is. The racquet is usually 18’’ and is composed of a composite material that produces a wood like effect. Tennis outside in the winter?! Yes, platform tennis can be enjoyed during the coldest and snowiest months of the year. The courts are built on raised platforms in order to keep the court clear of snow drifts during play. Being that the court is so small it takes very little time to clear the playing area of snow. Most courts are built with propane heaters underneath the court surface to aid in the melting of ice and snow. If you’re usually a player who heads indoors for the winter months, perhaps this year you can join the growing numbers who try platform and become players for life! 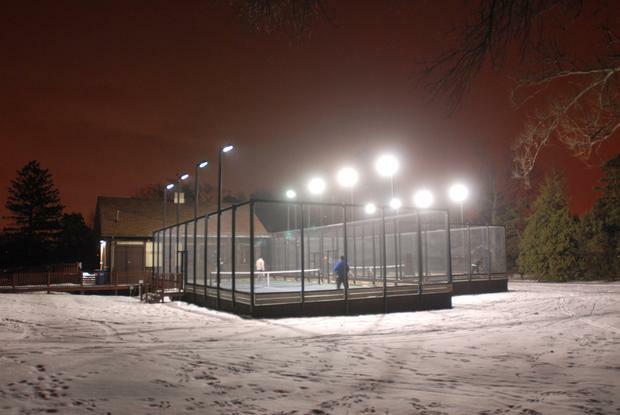 Platform tennis can be played throughout the winter due to under-court heating and floodlights.